Although popular lore suggests snakes should be feared or exterminated, relatively few are poisonous and they generally avoid humans. Besides, they can be the gardener's friend, as various snakes prey upon rodents and slugs. 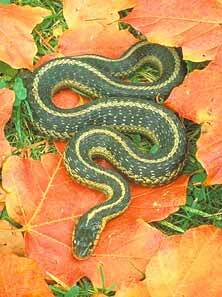 Seeing snakes in your yard is a sign that you have a healthy population of mice and voles. To encourage snakes to inhabit your yard and garden, provide them with a shallow dish of water and many cool spots to hide. Rock walls, woodpiles, or boards laid in the garden provide shelter and a place to soak up the sun's warming rays. Even though snakes are ″good″ guys in the garden, no one likes them in the house, so patch any cracks into your house or basement. Snakes particularly like the relief of a cool cement basement on a steamy summer day. If one does find its way indoors, call a wildlife control officer to remove it. If your fear of snakes is overwhelming, try discouraging them by removing weeds, woodpiles, rock walls, water sources, and brush where mice might hide. Commercial repellents or a fence can also be used to exclude them from a favored area.